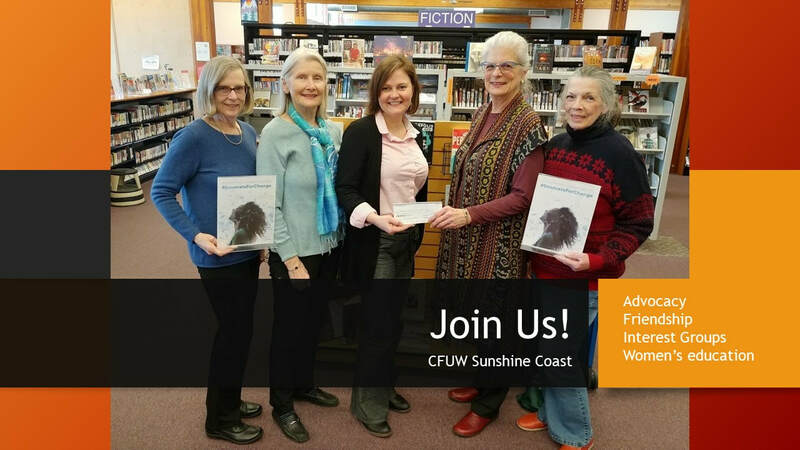 CFUW Sunshine Coast draws its membership from the communities of Gibsons, Roberts Creek, Sechelt, Halfmoon Bay, Pender Harbour, and Egmont. We hope that you will consider joining us and experience the support and companionship of a group of dynamic women, dedicated to improving the status of women and girls, promoting education, developing community partners and supporting each other. In addition, we have a lot of fun at our events and through involvement in our interest groups. Lifelong friendships have been made amongst those in our groups. CFUW is a non-profit, non-partisan, self-funded organization working towards the improvement of the status of women and girls, the promotion of quality public education, and advancement of human rights, justice and peace. We are affiliated with the international organization GWI. Membership is open to any woman who supports these purposes. As a member of CFUW Sunshine Coast you would be eligible to receive our monthly newsletter and participate in our Interest Groups. You would also be eligible for National benefits. Any woman is eligible for membership if she supports the purposes of CFUW. You do not need to be a University or College graduate. A student member is entitled to all privileges and responsibilities of being a full CFUW member, but pay only 50 per cent of the club dues. Dues are paid at the September General Meeting each year (and must be paid by December 31st). A prorated amount is applied to members joining later in the year. Annual dues are currently $110. A portion is paid to CFUW National and a nominal annual fee is paid to the Provincial Council. Three ways to pay, by credit card, electronic funds transfer or cheque. Pay your dues on-line.